There’s nothing like a nutritious breakfast to start the day. 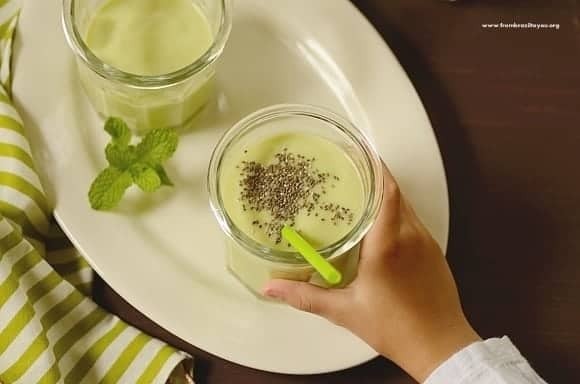 Our Instant Breakfast Avocado Smoothie (Vitamina de Abacate) is a satisfying, quick drink that can be enjoyed at the table or easily transported to school or work. It is made from avocado, Nestlé Carnation Breakfast Essentials® powder, fat-free milk, sugar substitute, and chia seeds. 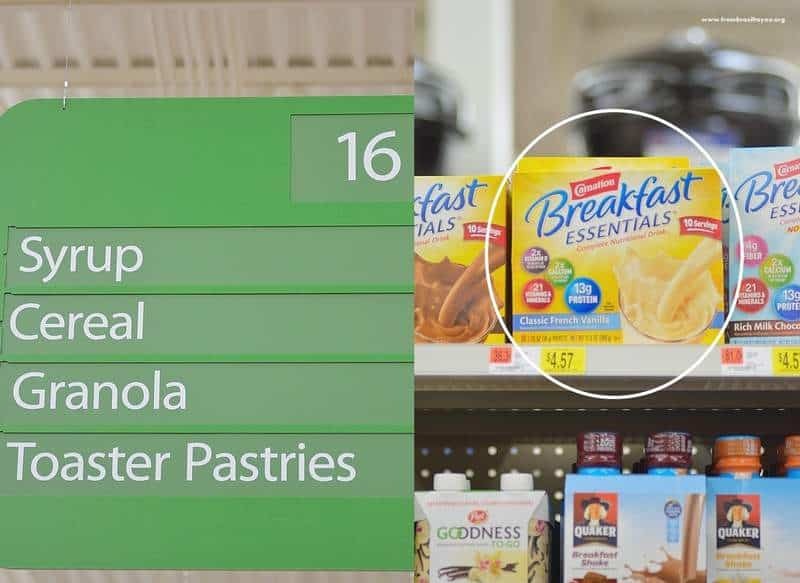 My family and I enjoy smoothies both at breakfast and snack time… As we had run out of ingredients, I stopped by at my local Walmart to buy my Carnation Breakfast Essentials® powder — which I conveniently found on aisle 16 near the cereal shelf. I have found this product to be an easy and convenient way to satisfy morning hunger. And of course, I still intend to take advantage of their promotional special. You should too! To do this, 1. Buy any 2 Carnation Breakfast Essentials product, 2. Snap a clear photo of the entire receipt and then text with keyword BREAKFAST to 811811 for submission instructions or email it to redeem@CarnationFreeBreakfast.com or upload your receipt to http://cbi.as/7qnt, 3. Receive a code back once the receipt has been verified and share with your friends and family for a free breakfast! (up to a $7.99 value). You can enter by texting a number, emailing, or uploading a photo of the receipt to the website. As we share breakfast, Carnation Breakfast Essentials® will donate $25,000 to Feeding America in order to help those in need. How great that is! 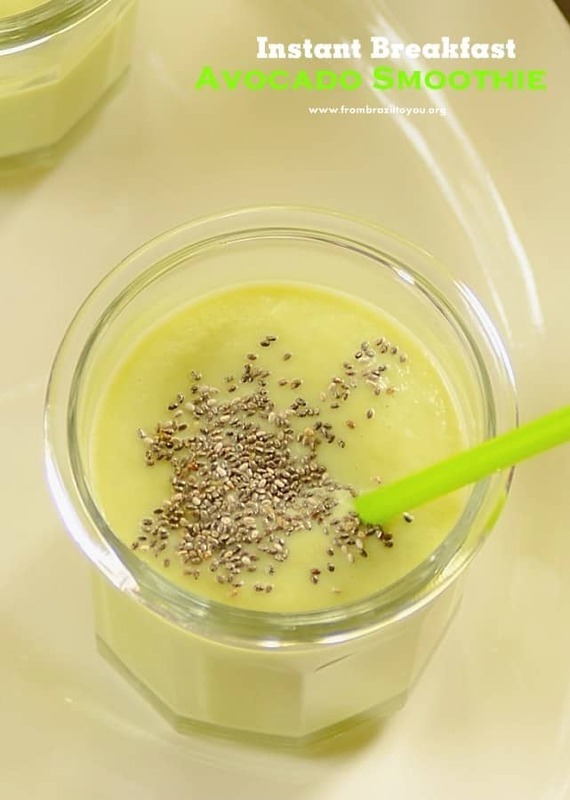 Getting everything ready to drop off kids at school and/or head to work on time is no easy task… but I can say that an instant breakfast such as our avocado smoothie with chia seeds saves time, all while giving our bodies something healthy. 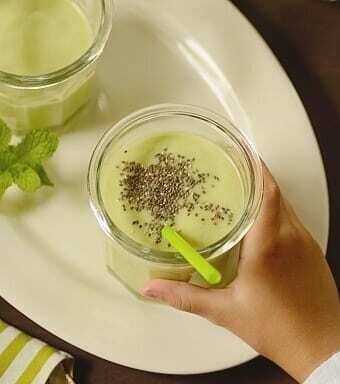 Enjoy our instant breakfast avocado smoothie and have an awesome day! 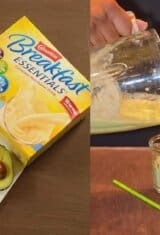 Instant breakfast avocado smoothie is a nutritious, satisfying, quick drink that can be enjoyed at the table or easily transported to school or work. It also makes a great snack! 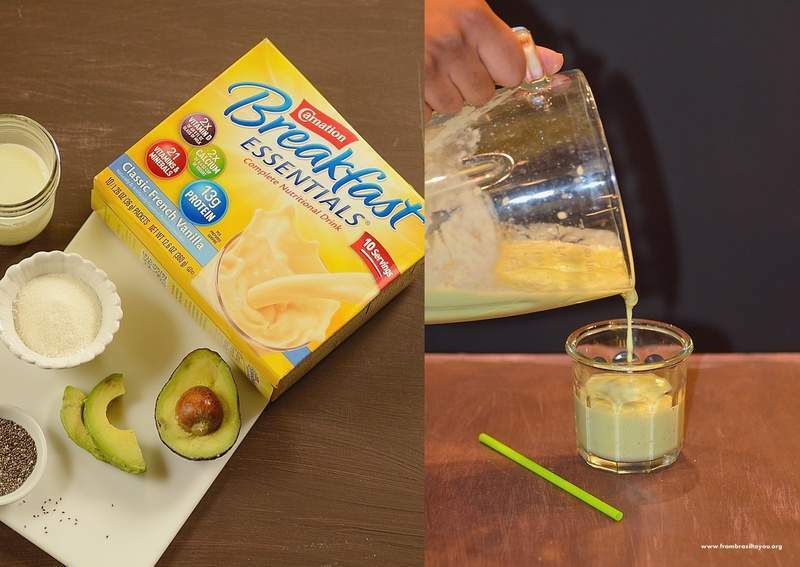 Place avocado, Carnation Breakfast Essentials® powder, milk or water, sugar substitute, and ice together in a blender. Cover and blend until smooth. Pour in a glass and sprinkle chia seeds on top. Enjoy! Sounds like a delicious way to start the day Denise! I love the idea of starting the day with a smoothie! Quick to prepare, yet a nourishing way to enjoy breakfast. This look incredibly healthy and delicious! Oh how I long to be sipping summer smoothies. It was minus 8c this morning. WT Fudge is that all about?! LOL. I love the look of your avo shake, very refreshing. I didnt really have too many of the avocado smoothie this past summer, they were rather expensive, so only for a treat. Fingers crossed next summer is better. I had no idea avocados were expensive in Australia. Wow! Well, I hope prices get better so people can enjoy much of this great fruit. 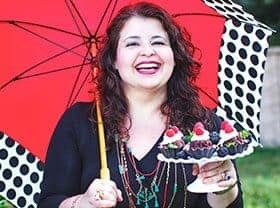 This is a very nutritious recipe Denise!! Perfect for breakfast!! We only have a question. Since we don’t have Carnation Breakfast Essentials in Greece, can we replace it by adding vanilla extract in the milk? Will this change the flavor? I see. No worries! You can add a bit of vanilla extract to the milk. You can also decrease a little bit the amount of milk — just enough to make the smoothie thick since you’re not adding carnation to your avocado smoothie. Enjoy!!! 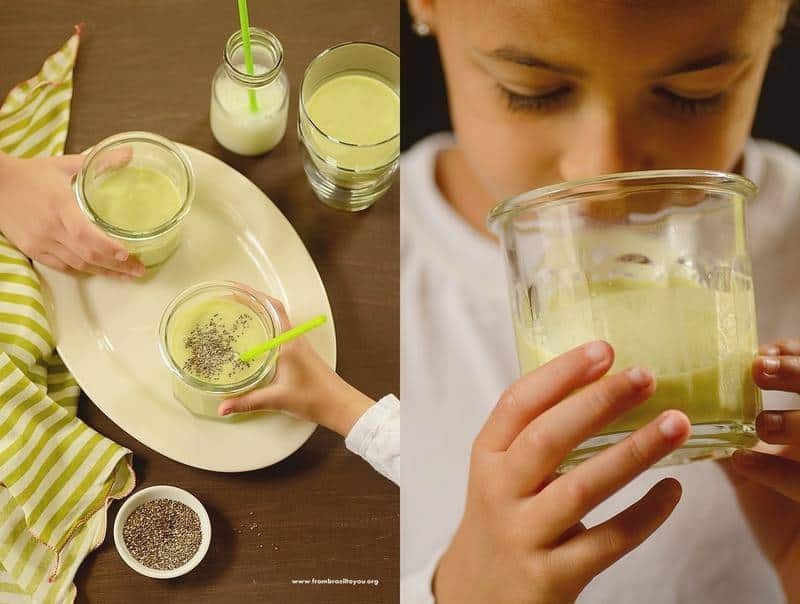 Yes, we used to have avocado smoothie very often when living in Brasil…looks great with chia seeds. what a lovely smoothie! I love it! Awesome recipe! i think i’m ready to perform sevral impacted wisdom teeth removal surgery once i had this for breakfast…. A deliciously satisfying and healthy smoothie, must try it! I have always wanted to try making an avocado smoothie, but i seem to chicken out at the last second. This looks so good, you might convince me to try again! Hi, Cathleen! I hope you try this. This smoothie has the creaminess of the avocado combined with the great flavor of vanilla Carnation product. My children are not big fans of avocados but they drank this smoothie without any problem because of its vanilla flavor. Actually, they loved it so much that they asked me to make it several times. Give it a try and see what you think. I know how difficult can be when one is already used to eat avocados in a certain way. Avocado is a fruit and and Brazil we eat it sprinkled with sugar, in smoothies, ice creams, and desserts. When I tried guacamole for the first time here in the US, I hated it. It took me about 2 years to get used to it, but nowadays I love it. I consume avocados in both savory and sweet dishes. Wishing a delicious and healthy week! Agree with Raymund here! That’s something similar to our FIlipino Avocado Shake. Truly refreshing! !